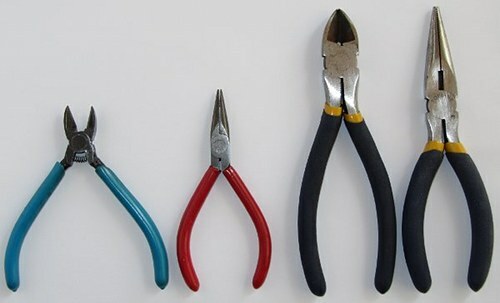 The side-cutters and half-round-nose pliers need to be the small type intended for electronic use. Do not get the bigger tools intended for use by electricians. The photo below shows the difference in size of electronics tools (left) and electricians tools (right). A soldering iron and stand or soldering station may also be needed by beginners. Although you will be building circuits on breadboard initially, with no soldering needed, some components will need to have wires soldered to them so that they can be plugged into the breadboard. This is only necessary from tutorial 12 in this series of beginner's tutorials. If you want to get a soldering iron when you are ordering other tools and components, then first read the article on soldering irons and then the article on soldering. The next part of this article shows what electronic components you will need.